Manuel A. Morán, shown at right, was profiled in the DNAInfo blog as a result of him directing and producing the Teatro SEA production of Sueño. A trilingual (English-Spanish-Portuguese) musical retelling of William Shakespeare's A Midsummer Night's Dream (complete with puppetry), it is adapted by Norge Espinosa (with English translations by Alan González and Portuguese translations by Adalberto Müller), and feature original music by Manuel Calzada and Alejandro Zuleta. The production boasts assistant direction by José A. Esquea, hair and makeup by Jeannie Sol, choreography by Daniel Fetecua, and scenic and puppet design by José López. 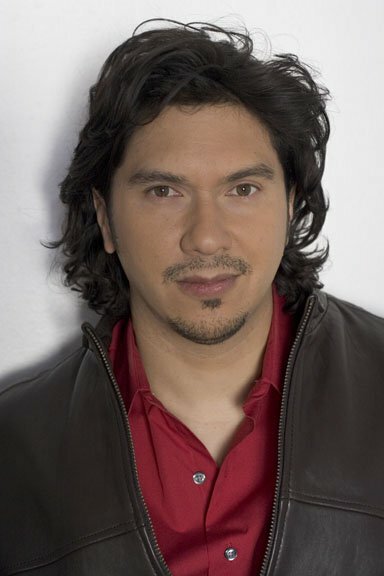 Sueño will star Nelson Landrieu, Adriana Sananes, Daniel Soto, and Milteri Tucker (see below) among others, and will be presented outdoors in June at the La Plaza space of the Clemente Soto Vélez Cultural and Educational Center (home to HOLA) in Manhattan's Loísaida neighborhood. To read the blog, click here. David Zayas is currently filming the movie Lost Cat Corona (written and directed by Anthony Tarsitano). The film also stars Sean Young, Ralph Macchio, Gina Gershon and Paul Sorvino. 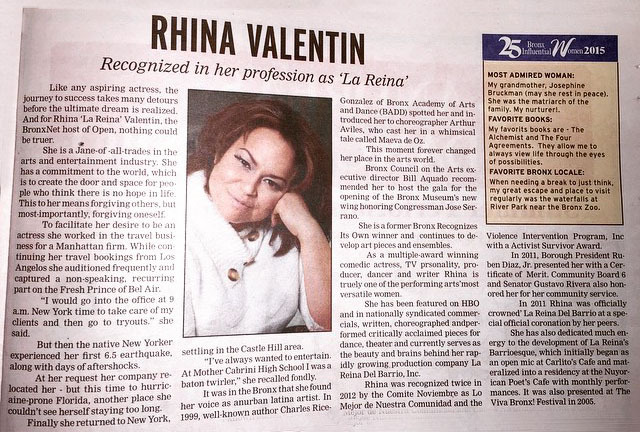 Rhina Valentín was profiled in The Bronx Times, where she was named one of the 25 Most Influential Women in the Bronx of 2015. To read the article, click at the image at left. Christopher Morriss will be starring in the Samsun Knight play Vanishing Point. Produced by Middle Distance and directed by Sophie Weisskoff, the play will be presented in New York City in August as part of the New York International Fringe Festival (fringeNYC) at a downtown theater to be announced. For more information, click here.